Defence Turkey: Mr. Fatih Yakıcı, first of all thank you for your time. You are about to leave a year behind with your task as the Head of Land Platforms. What kind of term did you leave behind from the day you took office? Could you please evaluate this one-year period? Since 2016, our department has realized various projects and achieved rapid deliveries in parallel with the increasing demands of requirement owners. In 2016, 11 contracts were signed and 8 RFPs were published. As of the beginning of 2017 up until now, we have signed 5 contracts. In line with these contracts, approximately 900 armored vehicles were delivered to the requirement owners in 2016, and since the beginning of 2017 until today, approximately 500 armored vehicles have been delivered to the requirement owners. In addition, studies related to our development projects were also performed intensively during this period. We also focused on generating projects for the integration of engines and transmissions, axles, suspension systems developed by our companies for our armored vehicles during this period. Defence Turkey: Due to the extraordinary circumstances of Turkey, it is seen that the direct procurement method has come to the forefront to cater to the immediate operational requirements of especially the General Directorate of Security and General Command of the Gendarmerie; this has occurred in a short span of time in the last 2 years. Within this context, the Turkish Armed Forces, together with the aforementioned institutions, have also made substantial procurements in 2016. How do you evaluate your performance regarding the projects where you are responsible for the timely and efficient procurement of urgent requirements? Could you please inform us about the deliveries made and orders received during the direct procurement process? We are exerting utmost efforts together with all our stakeholders in line with these extraordinary conditions that our country undergoes. As I indicated before, in 2016 various armored vehicles were delivered on time to the requirement owners with the greatest efforts of our companies and deliveries are continuing in 2017 as well. As the Department of Land Platforms, we made improvements in our processes in order to respond in a timely and effective manner to these requests which started increasing in 2016, and put into place different mechanisms for urgent procurements. Defence Turkey: What is the volume of the deliveries being planned for our Security Forces in 2017 after the substantial purchases realized in 2016? We aim to procure various configurations and class of more than 1000 vehicles by the end of 2017. 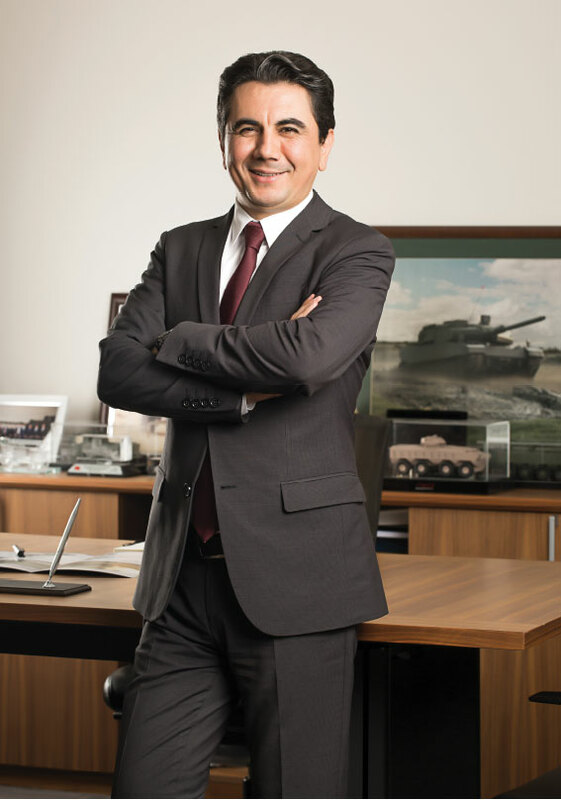 Defence Turkey: Mr. Yakıcı, in the “Altay” Main Battle Tank Program, which is one of the crucial programs of the Undersecretariat for Defense Industries, it was declared in June that the best and final offer (BAFO) submitted by Otokar was not accepted after the financial and technical evaluations and the decision makers made a decision to open tender procedure for the serial production phase. After this decision, the Request for Proposal (RFP) was issued for the mass production phase which comprises the procurement of 250 Main Battle Tanks. Within this context, to which companies were the RFPs issued? When we consider the urgent requirements of Turkey, could you please detail the projected schedule from the decision process to the production and delivery? Is there a possible delivery delay of 1-2 years with this new tender process? We have issued the RFP for the mass production of the “Altay” Main Battle Tank to Otokar, BMC and FNSS companies which are the prime contractors of the land vehicle sector and have various tracked and wheeled vehicles in the inventory of the TAF, Turkish Security General Directorate and General Command of Gendarmerie. These 3 companies have received the RFP. The bidders are to submit the tender offers within November this year. After the proposals are submitted, we will aim to have all of our studies finalized and bring the program to the decision stage. Defence Turkey: Mr. Yakıcı, for the mass production program, will there be a model where the companies stand individually or will there be a consortium model as it was in MİLGEM-S or Modern Infantry Rifle programs? When the infrastructure, Labor force and financial structure of these companies having the competence at this field are considered, the establishment of a commission is also on the agenda in order to follow all these processes under the coordination of the Undersecretariat for Defense Industries and to form an optimal path. What kind of process awaits us in this regard? We consider the “Altay” Serial Production Program as one of the comprehensive and crucial programs of Turkey as well as “Altay” MBT program which is a very critical program for the future of the Land Platforms Sector. By taking every possible alternative into consideration, we strive to focus on the solutions that keep our country’s interests at the highest level. As a result of these efforts, I believe that Turkey will be a global player in the field of defense and security with its unique design and advanced technology capabilities due to this ambitious vision, and we will form the most optimal solution for this program. Defence Turkey: In the “Altay” Mass Production Program, there is a need for an efficient life cycle management model that is well planned to cost effectively meet both the operational costs and the maintenance, parts and equipment needs as per the desired criteria and time during the utilization of the platform, along with the procurement costs, including the development, production of the platform and the entry of such platforms in the inventory. What kind of a model should Turkey establish together with all the stakeholders in the defense industry so that a cost effective, technologically superior, competitive platform having efficient logistic support package is revealed? What kind of responsibilities are to be assigned to all the stakeholders in order to create a holistic approach on the development, production and lifecycle management so that the unit costs can be reduced? Within the scope of the “Altay” Mass Production Program, in order to achieve the sustainability of our national industry for maintaining combat readiness of the “Altay” tanks and supporting the tank throughout its lifecycle, the aim was the development of a unique support system based on a unique Product Support Strategy that approaches the mass production process and the follow-on period as a whole by focusing on the operational requirements of the Land Forces Command and thus the RFP was issued to this end. Within this frame, essential responsibilities fall on both the procurement authority and on us, our companies being in the first place. Defence Turkey: Mr. Yakıcı, as part of the “Altay” MBT’s mass production program, are you in touch with the other partners from foreign countries in order to avoid the restrictions that may occur during the procurement of the systems and sub-systems that are especially subject to license restrictions? Moreover, are the programs for the indigenization of such systems that are conducted with the Sub-Systems Department proceeding? Could you please sum up the recent developments? We consider the powerpack as the most vital sub-system which we plan to develop indigenously in respect to mass production and which we will use by testing it at the system level in our tank. The activities for the utilization of the unique powerpack in the “Altay” MBT are being executed with the Sub-Systems Department of our Undersecretariat. At this point, our aim is to utilize our own national powerpack in the first tank produced through the serial production line; then again, we are constantly updating the project risks and measures in order to simultaneously conduct these two strategic projects that are massive in terms of budget and schedule. In this respect, we can claim that there are no technical or administrative obstacles for the utilization of our national powerpack at our “Altay” MBT, as soon as it is ready. Defence Turkey: How is the ongoing Development of an Active Protection System (AKKOR) for the “Altay” MBT proceeding? Could you please inform us on the latest developments? There are a very limited number of countries in the world which could achieve developing and producing an Active Protection System (AKKOR) as an end product. Therefore, the design process needs to be studiously maintained; the system has to be verified through numerous firing tests and the protection level has to be identified. The conceptual design process is on its course within the scope of the AKKOR Project. We plan to initiate the critical design stage in the first quarter of 2018. During the activities, various factors such as AKKOR System’s operating concept, counter measure scenarios, tank crew’s utilization scenarios, system’s integration to Altay MBT, threat ammunition data, etc. are being probed and the decisions made provide input to the design of the AKKOR system. With the help of the achievements acquired throughout the aforesaid process, activities to establish AKKOR Systems suitable for utilization in various armored vehicles that could operate in various concepts are being conducted as well. Defence Turkey: Mr. Yakıcı, an agreement was signed between SSM and Aselsan at IDEF for the protection of M60T Main Battle Tanks against anti-tank and asymmetric threats. Which type of retrofit activities will be placed over the M60T Tanks within the scope of this agreement? When will the modernization of the tanks be launched? In how many lots will the tanks be modernized? Could you please share with us details about the project schedule as well? Protective coating, Laser Warning System, Remoted-Controlled Weapon System, Close- Range Surveillance System, Air Conditioning System, Auxiliary Power Unit, Audio Alarm Systems are planned to be integrated to the M60T Tanks. The Project Implementation Schedule became effective as of 13 June 2017 and the deliveries are planned to be completed within 10 months. So far, integration activities of 20 tanks have been accomplished. Defence Turkey: The first prototype developed within the scope of the Indonesian Modern Medium Weight Tank Program was unveiled at the IDEF 2017 exhibition. The activities for the development and qualification of the second prototype continue with the cooperation between the Indonesian PT PINDAD and FNSS companies under the auspices of the Undersecretariat for Defense Industries. The qualification process is expected to be completed with the production of the second prototype in October 2017 in Indonesia and the certification of the Indonesian Army is planned to be obtained thereafter. What would you like to say about the acquirements of this cooperation between the countries, implemented for the first time particularly in the field of Land Vehicles, and the advantages it would bring us in the upcoming period? Regarding the field of land vehicles, Turkish companies recently established international cooperation with foreign local partners in various areas. However, the Indonesian Medium Weight Tank Project stands out as it is the first Government to Government (G2G) cooperation project in the land vehicles sector. The second prototype of the tank is planned to take part in the Indonesian Armed Forces Day Parade to be held in October 2017 and it is intended to be put to qualification tests, as you also mentioned. Within the scope of the project, diverse cooperation project models such as technology transfer, local production, and joint production were also carried out. Turkey and Indonesia established a long-lasting cooperation in the land vehicles sector with the Medium Weight Tank Project. Both parties benefited from the mutual transfer of experiences, and the fact that the project was completed in accordance with the planned schedule is an indicator of the harmony between the countries and the companies. With the help of the Project, we seized the opportunity to attract the interest of the other countries of the region by executing and achieving an international project with Indonesia which is a global scaled country powerful in its region. I believe that the Medium Weight Tank Project will be crucial for building cooperation with other countries in that region and that it will create a domino effect. The model implemented within the scope of the Medium Weight Tank Project constitutes a model for other land platforms and various types of defense sectors as well. We consider this project to be a concrete output of an international cooperation. As the Undersecretariat for Defense Industries, we intend to maintain this cooperation by extending it in the upcoming potential stages of the project. As the Turkish defense industry, we are able to provide more contribution to the project at the system and sub-system levels. We are accomplishing our evaluations for the future period through regular cooperation meetings with our Indonesian counterparts. Defence Turkey: You signed a contract with FNSS last year within the scope of the Anti-Tank Vehicle (ATV) program. A total of 260 ATVs composed of 184 tracked and 76 tactical wheeled vehicles are to be procured as part of the program. Which activities have been accomplished within this one-year period following the contract? When will the qualification and test processes of the configurations be completed? What would you like to say on the deliveries that extend throughout future years? The Anti-Tank Vehicles will be the vehicles with the most updated design, owned by the Land Forces Command, as soon as they enter the inventory. The KORNET-E and OMTAS Anti-Tank Missile Systems used by anti-tank squads over tripods on the ground will be integrated over the ATVs and utilization capability under the armor protection will be added to the vehicles. The ATVs are aimed to become agile vehicles with high operation capabilities due to the tasks they will perform and as they require to operate with the Main Battle Tanks. Through lessons learned from previous projects, efforts are exerted to render the ATVs user-friendly, task-oriented, effective and efficient vehicles as much as possible. Within the scope of the project, the design and development activities launched upon the award of the contract are going-on. So far, the System Requirement Review Meeting and Preliminary Design Review Meetings were held. The Critical Design stage is to be completed by the end of 2017 and the project activities will continue with the preparations for the qualification. In 2018, the completion of the qualification tests, establishment of the production line and realization of the pilot productions are planned to be accomplished. The deliveries will be launched in the first quarter of 2019 and will be completed within two years. In this way 260 ATVs will have entered the inventory of the Land Forces Command by the first quarter of 2021. A lifecycle logistical support package for the ATVs with the main contractor FNSS, in order to reduce the lifecycle costs and to increase the combat readiness level, is designed upon the entry of the vehicles to the inventory. We will launch the lifecycle logistical support package for the first time in a land platform project if the parties reach an agreement. We can consider the ATV Project as Turkey’s first step towards the New Generation Armored Vehicles. I believe that the feedback to be derived from this project would be valuable for the new generation vehicle projects. Defence Turkey: Within the scope of the New Generation Light Weight Armored Vehicle project, you declared at various platforms in the recent period that you expected the indigenization of all sub-systems and the development of the sub-system projects containing technology from the companies. What would you like to say about your expectations from the companies and the activities accomplished to this end? I believe that the gathering of the armored vehicle manufacturers and sub-system/part manufacturers in order to conduct negotiations would be fruitful toward reducing foreign dependency in armored vehicles that are planned to be procured within the framework of our project and toward establishing the maximum local contribution in the project. To this end, we accomplished a series of meetings hosted by the OSTİM Defense and Aerospace Cluster (OSSA), SAHA Istanbul Defense and Aerospace Cluster and Bursa Aerospace and Defense Cluster (BASDEC). The content and objectives of our project were briefed to the participants by our Department. Moreover, the armored vehicle manufacturing companies made several presentations on the sub-systems and parts they will procure and on their procurement methods. Following the presentations, various bilateral negotiations were held between the companies which are candidates for becoming the prime contractor and the sub-system/part manufacturing companies. In my opinion, new co-operations will be formed as a result of the aforesaid activities and they will provide positive contributions to our project targets. Defence Turkey: As part of the Mine-Resistant Combat Vehicle (MRCV) Procurement program, the procurement of 20 MRCVs with superior field capabilities, with high protection against mines, ballistic protection and protection against improvised explosive devices in 6x6 and 8x8 configurations is planned. When do you plan to release the RFP within the scope of the local development program? Which type of a vehicle is defined through the technical specifications of the project? Is there an aim for a completely unique platform different than the existing 6x6 and 8x8 platforms in our companies’ product range developed through their own equity? The RFP was released to the relevant companies on 25 July 2017. In order to enhance the operational capabilities in the regions with intensive counter terrorism operations being conducted, vehicles with cross-country capabilities, high protection against mines and improvised explosive devices, ballistic protection and high firepower in 6x6 and 8X8 configurations are aimed to be included in the inventory. The local development model was adopted within the scope of this project. The proposals are intended to be collected in a competitive environment and the delivery of a unique platform, in line with the project’s technical specifications, is aimed to be accomplished for the General Command of Gendarmerie as soon as possible. Defence Turkey: A total of 27 Armored Amphibious Assault Vehicles (AAAV) will be procured as part of the Armored Amphibious Assault Vehicle program that the Turkish Naval Forces aims to utilize within the scope of Landing Helicopter Dock (LHD) program. You have signed the contract with FNSS in recent months. The vehicles stand out with their striking features such as the capability of being launched from the water and self-righting capabilities. Which capabilities will these new generation AAAVs possess? Could you please elaborate these capabilities? In addition to the features you mentioned, AAAVs will be able to carry 21 fully-equipped infantries as well as 3 crews, they will have ballistic and mine protection at a certain level and will be able to move rapidly in water and on land. We expect them to have the capabilities of firing at targets with their unmanned turret with 12.7 mm Machine Gun (MG) and 40 mm Automatic Grenade Launcher (AGL) and perform operations at various sea levels. Even though we cannot compare them with any other vehicles, as there are no precedent vehicles in the Turkish Armed Forces’ inventory, we can still claim that they will have characteristics superior than the U.S. production AAV7/AAV7 RAM RS vehicles. Defence Turkey: Within the scope of the Special Purpose Tactical Wheeled Armored Vehicle program, the proposals of the companies were submitted to the Undersecretariat for Defense Industries. How is the evaluation of the proposals proceeding? When will the final decision be made? The evaluation process as part of the project is on its due course. We addressed several questions regarding the unique development and production of certain critical sub-systems that will exist in the vehicle to our companies and their responses were collected. Our revisions in this regard continue. We reached the final stage in the evaluation phase and the results will be presented to the Defense Industry Executive Committee following the completion of the assessments. Within the scope of the project, the signing of the contract is aimed to take place within the first quarter of 2018. Defence Turkey: A contract was recently signed with the TDU Defense Systems Company and Öztek Textile companies within the scope of the Multispectral Camouflage Net Project-1 and Camouflage Net Project-2. What are your remarks on the activities conducted within the context of this contract and on the content of these programs? In line with the Turkish Armed Forces’ requirements, the Multispectral Camouflage Net Project-1, conducted to increase the camouflage facilities and capabilities of the troops in the field, was signed in April with the TDU Defense Systems Company and the Multispectral Camouflage Net Project-2 was signed in May with Öztek Textile. The qualification tests conducted within the scope of the Multispectral Camouflage Net Project-1 signed with the TDU were completed and the deliveries are expected to be finalized in August 2017. As part of the Multispectral Camouflage Net Project-2 signed with Öztek Textile, the qualification tests are ongoing. The deliveries are aimed to be completed in August 2017. Defence Turkey: You recently signed a contract with BMC as part of the Battlefield Fuel Tank (AKTAN) program aiming at the procurement of a total of 84 fuel tanks in accordance with the requirements of the Land Forces Command and the Naval Forces Command. Could you please inform us on the latest status of the activities conducted to this end? Within the scope of the AKTAN project, regarding the procurement of a total of 84 Battlefield Fuel Tanks in line with the demands of the Land Forces Command and Naval Forces Command, the contract was signed on 28 June 2016 with BMC. Currently, the activities regarding the design period are being conducted. The production of the prototype is planned to be completed in January 2018. Defence Turkey: You have signed a contract with the company Katmerciler in June 2017 as part of the New Generation Crime Scene Investigation Vehicles (KIRAÇ) project. Could you please inform us on the program schedule as well as the vehicles to be developed? The contract negotiations with Katmerciler are ongoing and the final stage was reached as part of the negotiations conducted between the parties. The aim is for the vehicles to be procured earlier than two years. Two types of vehicles composed of 110 crime scene investigation vehicles and 10 laboratory vehicles will be developed. All vehicles will bear 4x4 capabilities as well as moving forward on flat terrain. The crime scene investigation vehicles will assist in attaining results by rapidly accumulating and examining evidence at the crime scene before taking them to the center. The Crime Scene Laboratory vehicles will function as a small laboratory to provide comprehensive examination of the evidence at the crime scene. Defence Turkey: Mr. Yakıcı, you previously declared your wish to launch certain pilot projects for moving onto a model applied by many countries in the world in which two or more companies compete over the prototypes they developed and the selection is accomplished over such a concept. What type of regulations do you plan to bring forth to this end through collecting the views of all shareholders? Besides, in which pilot programs is this model intended to be applied? We aim to implement the prototype competition concept applied by numerous countries in the world in our projects, too. The aforesaid method will be initially implemented in the pilot projects we will define and plan to make regulations toward availing the implementation of this method in our other projects in line with the feedback we will receive. In this direction, we intend to implement the prototype competition model in the New Generation Light Weight Armored Vehicles project and within the scope of the Tank Transporter Vehicle project, for which we plan to open the tender in the upcoming period. 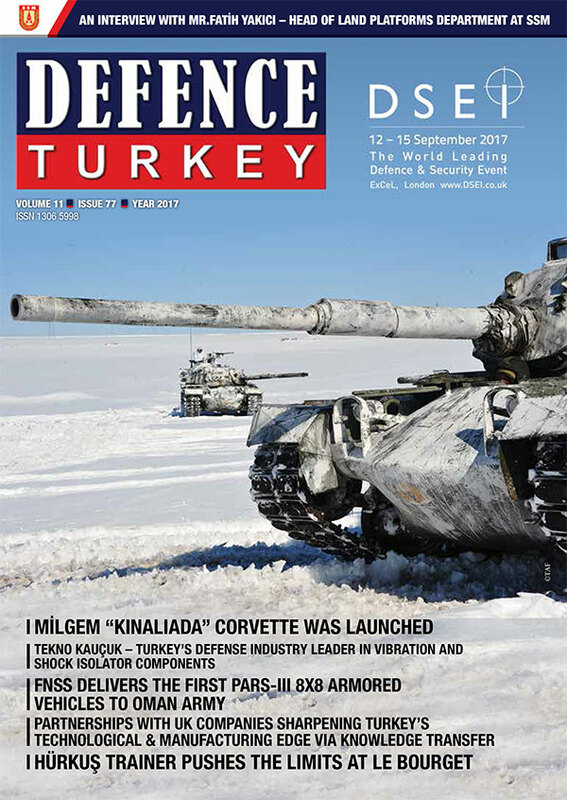 Defence Turkey: Which programs will stand out in the Land Platforms Department in the next decade? What are your comments on the potential new development programs and on the potential requests of our security forces in the upcoming period? What are your assessments in this respect? As I also expressed in the beginning of our interview, we have delivered quite a big number of armored vehicles to the procurement authorities especially in the last two years, in line with the developments that occurred in the recent period. We assess that this amount of procurement would continue for a few more years. Within the next two to three years, both the General Directorate of Security and the Turkish Armed Forces’ inventory will be equipped with the new armored vehicles. Moreover, through our New Generation Light Weight Armored Vehicle project we will have fulfilled the Land Forces Command’s requirements for the next ten years. Our existing armored vehicles have accomplished their tasks in the operation region within the scope of the Euphrates Shield Operation. With our companies, we paid regular visits to Çobanbey/Gaziantep where our armored vehicles’ maintenance services were given and received feedback related with the vehicles from our colleagues attending the operations. In this way, our companies commenced to work on retrofitting their vehicles and they are continuing the design of their new vehicles in line with the feedback. I would like to state that these visits were quite fruitful both for our procurement authorities and for our companies. To this end, we plan to achieve the actualization of planned, cost-efficient procurements that take the lifecycle logistical support into consideration in the land vehicles sector in the upcoming period by analyzing the status of the vehicles in our inventory and evaluating future requests. Defence Turkey: Dear Mr. Yakıcı, finally, is there any message you would like to convey to the readers of Defence Turkey? Our Land Platforms sector is the leading sector of our defense industry. The superior performance displayed by our sector at home and abroad are the best instance of this quality. As we have done so far, we will continue to offer systems based on developed cutting-edge technology for our security forces and increase the local participation rate in our programs to highest levels possible. I would like to take this opportunity to thank all my colleagues for taking part in these activities and in the actualization of these projects, working with great sacrifice and I would like to thank you for giving me the opportunity to share my views regarding the sector.